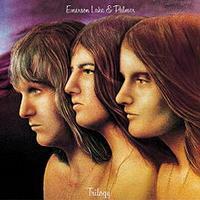 The third album from Emerson, Lake and Palmer this has some great pieces of music. To me, it seems a little keyboard dominated. At least, it seems more so than some of their other discs. That said, when the keyboardist is Keith Emerson, that’s far from a bad thing. To me, it makes the album feels just a little unbalanced, though. Still, it’s a strong disc and a great representation of the band. It should be noted that I reviewed a couple of these songs before on a best of album review. For the sake of consistency, those song reviews have been copied or adapted for use here. This diverse rocker is a cool one. It’s got some intriguing vocal sections, but also some interesting instrumental ones. Lake puts in a killer performance on the vocals, but the whole band finds chances to shine. This is a short, less than two minutes, piano solo that’s dramatic and quite classical in approach. As you might guess this is essentially a reprise of the track that came before “Fugue.” It’s just a short one that brings it to a satisfying conclusion. Starting with an acoustic guitar ballad approach, this is a pretty cut. The bouncy sort of easy going groove that they move into reminds me somehow of the Doobie Brothers, but this is definitely a powerhouse. The keyboard solo on this is very tasty. There is some studio chaos at the start of this. That gives way to a drum workout. The band launch into this fun rocker from there. I love the keyboard sounds on this thing. It has some cool shifts and changes, too. There is a little old time music jam at the end of the cut. It feels like an old movie. An energetic rocker, Emerson’s keys really drive this. He really gets into some crazed territory as he continues. This instrumental is definitely an Emerson showcase. Piano starts this and the vocals come in rather ethereally over the top. It builds on that format gaining energy as the piano weaves all kinds of melody lines. That piano definitely leans toward classical music. Around the two minute mark the arrangement threatens to expand. More classical styled music, this time minus vocals moves it forward. The piano starts rocking about a minute later and then the other instruments join in a killer ELP jam. It’s still classically tinged, but it’s definitely rock. The vocals don’t return until around the five and a half minute mark. By then it’s become a really rocker. The singing fits that change. Musically we’re taken through all kinds of twists and turns as it evolves. Emerson purely shines as the instrumental jam works it to the next vocal movement. There’s a bluesy little jam at the end to take it out. .
Emerson’s keyboards start this. Greg Lake’s vocals are uncharacteristically deep. This is sort of a blues groove. It rocks out like crazy, though. Although Emerson’s keyboards really dominate this, Lake’s vocals give them a run for their money. This starts on keyboards. Those keyboards remain fairly mellow, but build gradually. They are unaccompanied as they do so. As it approaches the two minute mark, the rhythm section starts to emerge. Still, it’s the keyboards that rule this show. While the basis of this is definitely classical music, it gets quite rocking as it builds. This is quite a cool instrumental. It’s trademark ELP in so many ways.